When your vehicle lease is due for return, get cosmetic repairs done first. Is your lease car due for return? Typical wheel arch repair before and after. This is the kind of damage we repair on lease vehicles – and the lease company is none the wiser. Do you lease a vehicle (or a few!) and it’s time to return? 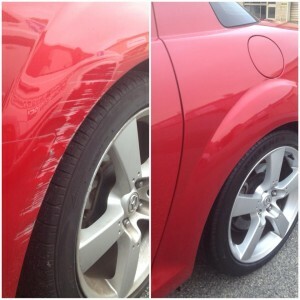 If yes, you may be wondering what to do about the minor scratches and paint damage the vehicle has suffered. In our experience, we have seen many lease cars, especially company cars, endure a lot of wear and tear during their lease period. Unfortunately, paint damage including scratches, dents and dings is not regarded as “fair wear and tear” by most lease companies… let alone wheel damage or bumper bar dents. What can you do before returning your vehicle? Firstly, you can get an independent assessment of any cosmetic damage that you see (or can’t see) on the lease car. This empowers you, so you know excatly what repairs are needed. There’s nothing worse than getting an exorbitant bill from the lease company for a panel shop repair that you knew nothing about! Secondly, you can arrange a time for us to repair the damage. We will come to your business and repair dents, dings, scratches, bumper damage and whell damage on-site. Our prices are significantly lower than panel shop or dealership repairers, so you will be saving a lot of money by repairing the damage before you return your lease car. In fact, the Perth businesses we work for on a regular basis admit that we save them thousands of dollars on charge backs every time their lease cars are dur for return. That’s because we help them return their cars in pristine condition! Don’t leave it until it’s too late. If you’re a lease car manager or administrator, please don’t leave repair work until the last minute. Why not schedule our services as part of your regular lease car maintenance routine! Remember, we’re pretty busy and can often be booked out 2-3 weeks in advance. So call today! Book our lease car repair services at lease 2-3 weeks before your car is due for return – that way you can relax and not worry that you’ll be forking out thousands in unecessary panel shop repairs.